I know you won't believe me, but I got home at 10:30 pm last night. Very unspinsterly. I was out having a lady date with my friend Eric's girlfriend, eating Bibimbab. Sometimes you need a good fix of Korean food. Not to worry, though, I had already done today's surprise portrait! 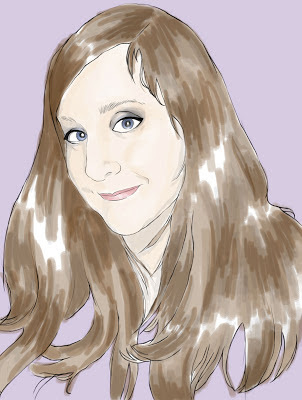 Today's surprise portrait is of Glipho staffer, Rachel Monte. I have had the pleasure of corresponding with Rachel on a few occasions, and I find her to be delightful. She, like Roger Planes and other Glipho staffers, is great about positive feedback, support, and commenting. You can find her awesome blog on Glipho here. Now a word about the photoshop journey. This is my first close up lady drawing, and the hair was actually more difficult than I had expected. I'm trying to find a way to mimic the effect of my Chartpak markers through photoshop brushes and adjusting the transparency, but I'm not quite sure I've got it right yet. Good thing I'm a spinster and have plenty of time to devote to developing this skill. The journey continues!